Tim Bennett (left) puts a foot in as Sam Karl watches on during Loxwood's defeat to Eastbourne United. All pictures by Jon Rigby. 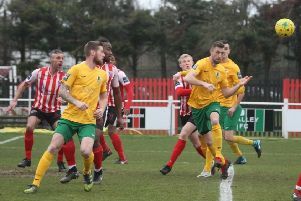 Alex Walsh rued Loxwood’s lack of cutting-edge in the second-half as they succumbed to a 2-1 away defeat to relegation rivals Eastbourne United in the Premier Division on Saturday. In windy conditions, Sam Willett’s first-half penalty gave the Whites the lead before the Magpies levelled with a spot-kick of their own from Mark Goldson in the second period. Sam Willett tucks home his penalty for Eastbourne United. Dan Rogers hit the winner for the hosts as United held on to claim a priceless victory in their bid for survival. 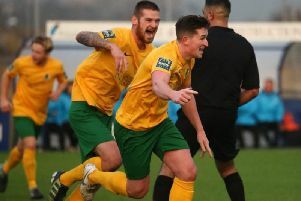 The win for second-from-bottom Eastbourne United has cut the gap between them and 16th-placed Loxwood to just six points going into the final six games of the season. Walsh said: “We had enough chances in that second-half to win the game so that’s where my disappointment is really. “It’s more the fact we should have scored more goals in the game really. Vincent Follea gets on the ball. “It wasn’t a great spectacle of football to be fair. I’m sure lots of games in Sussex looked very similar on that Saturday. “It finished 2-1 on Saturday but we’ve still got six more games and we know what we need to do. United were awarded a penalty on 13 minutes after a shot struck the hand of a Magpies player and Willett calmly stepped up to give the hosts the lead. With the Whites ahead at the break, Loxwood found the equaliser from the spot on 72 minutes. A good run into the box from Goldson drew a foul from a United defender and the Magpies forward dispatched the penalty that he had won with ease. But four minutes later Rogers tucked home the winner to lift the Whites off the bottom-of-the-table. Walsh added: “It was a game in which we wanted to get at them. “It was a frustrating game because we felt we got ourselves back in the game and it was all us second-half but they’ve gone up the other end and taken the lead. “It was difficult to come back from that after putting so much into the second-half. Loxwood host Peacehaven & Telscombe on Saturday. Loxwood: Matthews, Dawson, Broughton, French, Boiling, Courtney, Cowan, Follea, Karl, Goldson, T Bennett. Subs: Robinson, Smith, Popham, E Bennett, Ogunrinde.